Hi, everyone. 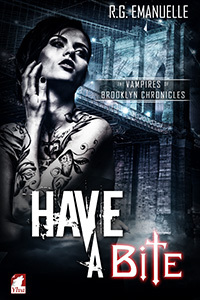 Today I just want to direct you over to Women & Words, where you can enter to win a free copy of Have a Bite, my new vampire novella. I’m giving away one print copy and one ebook copy. All you have to do is leave a comment, and you have until next Thursday, May 26. You can also catch the synopsis there. Go enter today! Good luck! Next Post Why Does Technology Hate Me? I can’t wait to read! Sounds great! Hope you enjoy it! Thanks, Lori! I hope it is, Kim. Thanks! Oh fun! I love vampire books. Thanks for sharing and congrats on the upcoming new release!